SAN DIEGO, USA and SWINDON, UNITED KINGDOM--(Marketwire - Feb. 19, 2013) - Cygnus Broadband, the Quality of Experience ("QoE") specialists for rich media streaming, a subsidiary of Wi-LAN Inc.
3G and LTE small cells maker Ubiquisys has raised $19m in an oversubscribed round. The company will use the capital to generate further profitable growth and accelerate delivery of innovative tri-mode 3G/LTE/WiFi small cell hotspots. London, UK – Ubiquisys, the developer of 3G and LTE small cells, will demonstrate smart cells running on a live mobile network at Small Cells World Summit in London on 26-28 June. 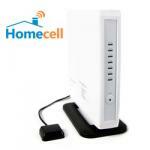 The smart cell is a new class of device: a small cell base station with a fully integrated cloud computing platform. Mobile World Congress, Barcelona – 27th February 2012 - DOVADO, the supplier of mobile broadband routers, and Ubiquisys, the developer of 3G and LTE intelligent cells, today announced that they have successfully demonstrated a 3G residential small cell with LTE backhaul. VANCOUVER, BC and Swindon, UK – Intrinsyc Software International (TSX: ICS), a leading developer of intelligent connected devices, and Ubiquisys, the developer of 3G and LTE small cells, will demonstrate Small Cell WiFi Wake-up at Mobile World Congress, February 27 – March 1. Swindon, UK - 17th February 2012 - Mosaic Telecom, the regional US operator serving rural Wisconsin, is now providing its customers with femtocells based on the 3GPP Release 9 open standard. The Mosaic Home Cell is provided by Ubiquisys, the developer of 3G and LTE small cells, as part of a Nokia Siemens Networks femtocell solution. French mobile operator SFR is offering free femtocells to all of its 10+ million 3G customers.